So a few weeks have passed and as each day goes by I am slowly warming to the Nomad. Yes, it still has the bog and rust in it but there are some positives that I can point to that has me thinking the end result will be worth it. The roof is good and holds a magnet which will save me a small fortune as the back half of the roof is ribbed and impossible to replace. The front guards around the headlights appear good as well with only a very small slit of sunlight visible through the fender right on the edge. A few extra bonuses came with the parts. 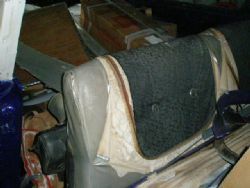 All the interior trim, although in OK condition is destined for land fill. The brand new carpet set avoided getting soaked and should be utilised down the track. A new grille, some emblems, fasteners, rubber seals and other odds and sods will help partially stall the fast expanding spreadsheet on required parts. The car had a flat battery so once that was replaced and a little unleaded poured down the throat of the tank the time came to fire it up and see what we had. 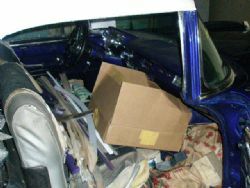 It turned out the 327 small block checked out as being from a 63-67 Chevrolet and could be in the range of 250–375 horsepower. 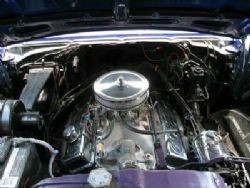 They installed these engines in the Chevelle, passenger cars and Corvette. It wasn’t possible to tell from the numbers exactly what it was, but on its first firing it sound and ran good. I reversed down the drive, swung around in the cul-de-sac and motored back in the garage. 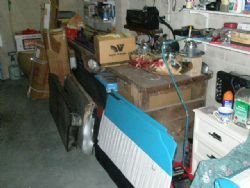 The brakes worked, the electrics worked and the rumble out of the two and half inch pipes out back and the Flowmasters bought a smile to my face. I hadn’t driven a three on the tree since my FB Holden and there was no mistaking this for anything but a fifty year plus old car. I went inside and had just finished a chat with Alan Newton from the Lets Go Cruisin Car Club in Victoria about putting his events up on Classic Car Gurus so I went to their website to lift the flyers and logo for inclusion. Flashing in my face from their home page was a yellow backed message saying “special offer on GM motor and gearbox” and knowing I was going to do a transplant in the future I had to check it out. It turns out the club has a strong relationship with their sponsors Holden Genuine Parts and Preston Motors (Parts sales) P/L and they had included the club in a special offer on Gen IV LS2 engines, 6 speed gearboxes and the bits and pieces to get them running in a classic or hot rod. The pricing was unbelievable and I realised the orders had to be in by the following day or you missed out. After some serious spade work on her indoors to get the nod, I placed an order. Confirmation was forthcoming that all the components I ordered would be shipped and by chance the Nomad would now have an all aluminium 6.0 litre small block backed by the latest 6 speed manual gearbox as fitted in the latest model Commodore. One very happy chappy, thanks very much! So the next part of the puzzle was to put the engine up on eBay along with the driveshaft, gearbox, radiator and any of the other stuff that will get jettisoned as the new drive train goes in. Not knowing what the engine was like and being too slack to give it a compression test I figured anyone interested will come and have a look and check it out in person. Of the twenty five plus emails and phone calls I got, only one guy came and checked it out. That didn’t stop everyone else from bidding on it though. eBay makes me laugh at times. For the first five days, there were two bids and ninety one people watching the listing. On the sixth day, two more bids. In the last hour, it went ballistic. I wanted more than a grand for the motor, but listed it at $650 as I hadn’t driven it any distance and hadn’t had it checked out. It eventually sold for over $1300 and I had three guys ring me after the auction to say if the deal falls through, they will buy it!